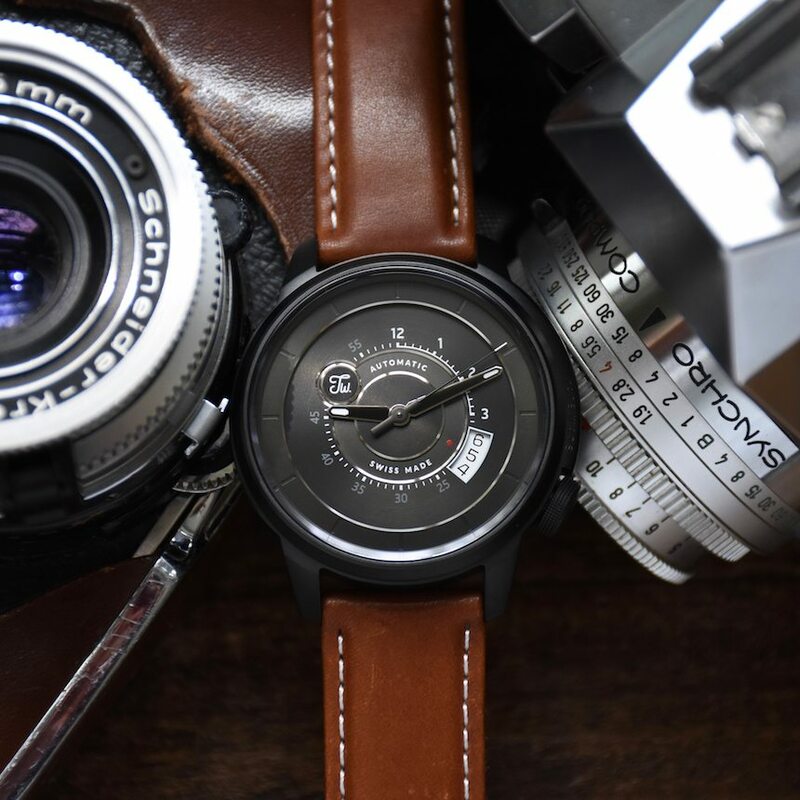 The engineering roots of cameras and watches often intersect and Tate Wade is trying to do that with its Bokeh model now live and already fully funded on Kickstarter. The camera-design inspired watch has a Swiss movement in a black PVD stainless steel case and sapphire crystal. Tate Wade is an independent producer of wrist watches based in Bienne, Switzerland. Bokeh is the Japanese word for the way an area out of focus can enhance an image. The young entrepreneurs created their company in 2015 with ambitious goal of reshaping the watch making practices in Switzerland. Although that sounds like a pretty big mountain to climb, they already passed their first base camp by getting funding on Kickstarter. They are offering three styles: stainless steel, gun metal PVD and a black PVD. I got my hands on the latter version and the case size and shape made an immediate impression. It is an ideal size and weight for a modern day watch with a stepped case raised crystal and a beefy crown at 4 o’clock. The black PVD case and brown leather strap are the perfect combination of colors and texture while the dial offer some depth and mixed design elements to keep you on your toes. Its dial is made from multiple layers of black disks with the first starting at the outer most edge. This disk has reflective beveled edges between each layer and twelve subtle imprints at each hour. Nothing else makes the hour mark stand as the hour hand’s small, white luminescence tip reaches the outer disk. The second dial disk is lower than the first and holds the white Arabic hour numerals at 12 and 3 o’clock. Between the hours of 3 and 5 is a large three-numeral-wide date window that gives a blast of white on an otherwise dark dial. This is part of the subtle nod to the camera design element they intended, but I wonder if it draws too much attention to the date and less emphasis on the time. To help define the date, the center numeral is marked with a red dot, which is also the only color on the dial. This is a subtle reference to the same red dot on the lens of a 35mm camera. Between 5 and 11 o’clock, the numerals switch to 25, 30, and on at every five-minute increment, but they are also in gray and not as easily contrasted against the black dial. The unconventional switch to this time-telling format becomes a subtle time telling challenge. The company’s namesake is at 10 o’clock in a small polished circle framing the script initials. The third dial sphere under the hour markers frames the words, automatic under 12 o’clock and Swiss Made above the 6. Both sets of information are bold, uppercase white letters that stand out on the dial. The final black disk on the dial is raised and has polished sides and serves as the platform for the hour and minute hands, which are glossy black metal with polished edges with a framed white luminescence at each tip. Overall the dial design is comparable to the camera lens f-stop, shutter speed and focus ring of an older camera. I love that inspiration, but wanted more obvious reference to cameras and clarity on the time. The case measures 42mm x 9.1mm thick with 20mm lugs, although it doesn’t feel that large. I attribute it to the stepped case from the bezel to the base of the lugs. The sapphire crystal stands out and up off the case another 1.85mm and adds to the visual layers from the side. The back of the case is a handsome flat black with four screws securing the back to the case. It also has a window at 11 o’clock allowing you to see the Swiss ETA 2824-2 automatic movement. The leather strap has a black, signed buckle and was a little stiff and took a few wears to get it to fully embrace my wrist. It got easier to size and wear with a few tries. The back of the strap offers the quick release spring bar system making this watch ready for other options. Why doesn’t every strap come with these? Over all the unique dial design, Swiss movement, sapphire crystal and model options make this Kickstarter stand out to me especially if you have a photographic interest and want to be a part of a couple guys trying to take on the Swiss watch industry. You can see your project options under $500 here. Brand & Model: Price: Who we think it might be for: This is for the camera lover who is looking to match their picture taker with his time keeper. Would I buy one for myself based on what I’ve seen? : I would consider a steel version. If I could make one design suggestion, it would be: I would recommend that they use more obvious camera elements and enhance readability. What spoke to me the most about this watch: The dial has that camera vibe and loved studying it. Thanks for the great hands-on review. The reviewed one is a pre-series for test purpose which has a white date. The actual one will have a black date as seen in the campaign page.